The holiday season is one of the most special times of the year. In anticipation of the upcoming holidays and another winter season, towns across Pennsylvania are holding special winter events and activities. Fire up your RV and cruise throughout the state to these three festive December events. This annual event is taking place right now and lasts until December 31. 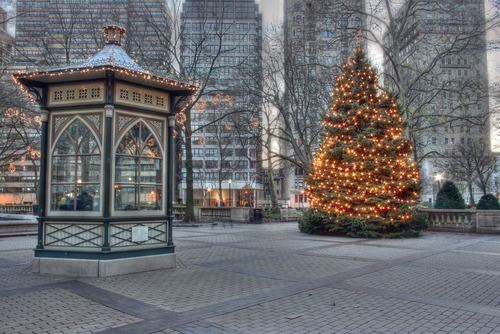 It’s free to attend and is located in Philadelphia’s Franklin Square. The main draw is the Electrical Spectacle Holiday Light Show, which features 75,000 lights set to music. You can also meet Santa, enjoy rides, and partake in food and drink by fire pits. It’s free to attend. Drop in at Gettysburg to visit President Eisenhower’s home, which is decked out for the holidays just as Mamie Eisenhower would have had it. There are even authentic Christmas decorations on display from his presidential years back in the 1950s. Park interpreters will be present to provide more information about the displays and to give presentations. Admission is $9 for adults, $5 for children, and free for those aged 5 and under. Then there’s a special Christmas concert happening in Sharpsville on December 19 at the Sharpsville Historical Society at 134 N. Mercer Avenue. The society has recently restored an 1882 Pomplitz Pipe Organ, which will be played Joseph Bandi, the musical director of Lakeview High School. There will be a chamber choir accompanying his playing as they go through a set list of Christmas classics. Donations will be accepted to benefit further restoration and maintenance of the pipe organ. There will also be refreshments after the performance. Fretz RV is offering unbeatable holiday deals to get you into a new RV this holiday season. Stop in and see us in Souderton, Pa., to find your dream or RV or shop our parts department for this year’s best camping supplies.